·Equipped with the Cummins turbocharged, inter-cooled diesel engine. ·Equipped with the hydrodynamic torque converter and transmission gearbox manufactured by the Hangzhou Advance Gearbox Group Co., Ltd with ZF technology. ·Electro hydraulically controlled, easy operation. ·Rear axle is a three-section drive axle specially-designed for grader, and equipped with the imported no-spin differential. ·Stable and reliable working hydraulic system with the double-pump, dual-circuit open system. ·Safe and reliable braking with the advanced hydraulic braking control technology. ·The beautiful driver's cabin is equipped with the top-mounted air conditioner, which features wide vision and good airtightness. ·Novel and unique shape, streamline engine hood ensure easy maintenance and heat dissipation. ·The front blade, scarifier, rear ripper, circle and automatic leveling device can be selected according to the customer's needs. 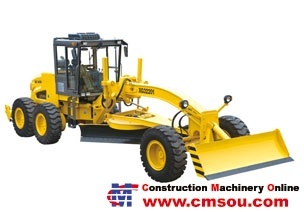 This series of graders are suitable for the leveling, excavating, sloping, bulldozing soil-loosening, snow-removing and other operations of large-sized grounds such as road, airport, farmland, etc.